The danse macabre is set to the tune of secrets. Who knows them, who keeps them and who's willing to share - for a price. Now you have a place to keep all of your Vampire character's secrets. Just beware the player looking over your shoulder. 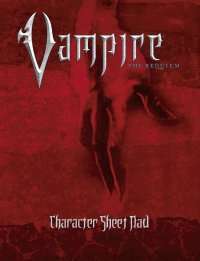 Continuing its line of tools for the Storytelling System™, White Wolf provides this indispensable collection of Vampire: The Requiem™ character sheets. This pad contains one character sheet from each Clan and Covenant combination (that's 25 sheets total). As a bonus, the quick reference side of the Storyteller's Screen is included, which displays all the necessary rules and charts for easy reference during game sessions. This title was added to our catalog on September 06, 2004.